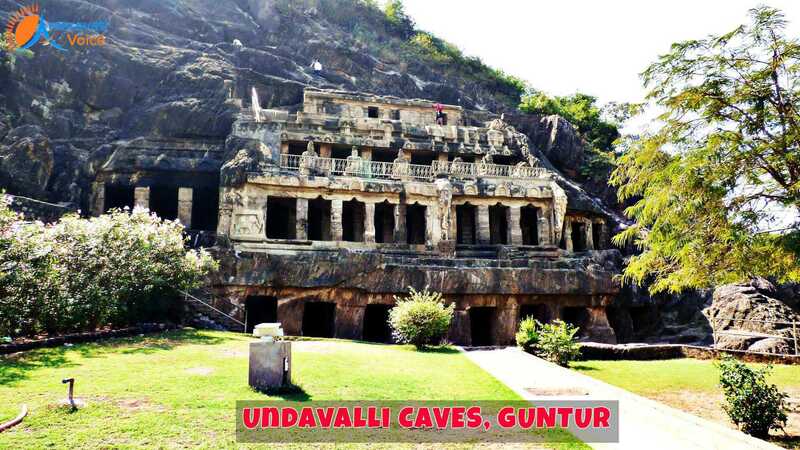 Summary: Many of us love to explore the olden and historical architectural beauty and if you are one such individual, the place you should plan your visit to during your Vijayawada/Guntur trip is Undavalli Caves. Mountains around the city of Vijayawada are known for their rich rock-cut architecture. But, the largest and the magnificent among these rock-cut architectural spots in the city is the Undavalli Caves. These caves stand as the proof of architectural expertise of 4th and 5th centuries. The many murals and sculptures in these caves are attractively carved in the four-floor high rock-cut temple. The Undavalli Caves are known to be associated with Vishnukundina Kings. This was the persuasive reign that ruled over a huge part of the old India during 420 to 620 AD. These caves were known to be devoted by the local Governor Madhava Reddy to the Narasimha Swamy and Anantha Padmanabha Swamy Temples. As the first Vishukundina King was supporting the Buddhism, these caves were initially dedicated to Buddhist temples. It is found that these caves were used by Buddhist monks and there are statues associated with Buddhism till date. However, later the caves were taken over by Hindus and most of the artwork that can be found in these caves up to this date belongs to Hinduism. Many people believe that there was a 9 km long underground passage that led to the Mangalagiri Mountain from the Undavalli Caves. But, they are of the opinion that it is kept closed nowadays by authorities to avoid accidents. There are many smaller rock-cut chambers close to Undavalli caves, but the important focus is given to the large four-storied cave. Even though, when viewed from a distance, this cave looks like an abandoned fort, but when getting close, you will get an exciting sight of monolithic sandstone cliff. These caves as mentioned earlier, has four floors and these caves were constructed in such a way that each consecutive caves lessens the other and the façade is 29 m wide. From the construction and from the paintings in the caves, it is found that Gupta Architecture is prevalent in these caves, while many details on the second floor showcases the influence of Chalukyan Architecture. Initially, the caves were shaped as Jain dwelling and from the first floor, Jain style is eminent. The vihara showcases Jain Monastics and encompasses Tirthankara figures. The first level of the cave is known as Vihara and it encompasses the artworks of Buddhist. As mentioned earlier, these caves served as Bhikkhu monastic complex earlier. The second floor of the cave is dedicated to the idol of reclining position of Lord Vishnu. This idol called as Anantha Padmanabha Swamy is known to have been carved from a single block of granite stone. The third floor has numerous structures inclusive of depictions for elephants and lions. There is an opening in this floor that provides the beautiful view of the other green hills. The other shrines in the cave include the shrines of Trimurti: Brahma, Vishnu and Shiva. Each of these shrines was carved with pillared hall in front. In Hinduism, Trimurti is known for the performance of important functions namely, formation, protection and destruction. These caves are located in the village called Undavalli in the Tadepalle Mandal of the Guntur District. It is located near the southern bank of the Krishna River at a distance of about just 6 kms southwest of the city of Vijayawada and about 22 kms northeast of the city of Guntur. So, plan your visit to this spot during your visit to the Guntur or Vijayawada cities for vacation.